This entry was posted in RU and tagged новости on June 28, 2012 by FEMEN. This entry was posted in IT and tagged notizie on June 28, 2012 by FEMEN. 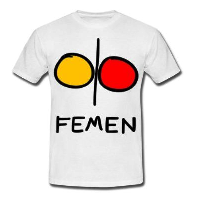 This entry was posted in IT and tagged notizie on June 27, 2012 by FEMEN. This entry was posted in RU and tagged новости on June 27, 2012 by FEMEN. This entry was posted in DE and tagged nachrichten on June 27, 2012 by FEMEN. Немецкий таблоид извинился перед украинцами "за страну проституток"
This entry was posted in ES and tagged noticias on June 27, 2012 by FEMEN.